The workers of Seung Yeun Technology Industries Corp. (SYTIC), a subcontractor for big US electronics companies and is based in the Philippines’ biggest export zone, are once more facing a fight in their exercise of freedom of association. After 18 workers earlier dismissed for union activities were reinstated as part of an agreement to end a five-day strike, the management of SYTIC is pushing through with the shutdown of the company. Last April 25, management filed for permanent closure. The SYTIC labor union , which comprise a majority of the workers and is in the process of being certified as the sole and exclusive bargaining agent, asserts that the closure is illegal because it is intended to subvert the exercise of freedom of association and bust the union. In response, the SYTIC union has called for negotiations with management about the impending closure and the reported takeover by its customer C-Pak Pte Ltd, a Singaporean company. Moreover the SYTIC union is calling for the absorption of the present employees into the new company, should the takeover push through. C-Pak Pte Ltd is owned by the group Dou Yee of Singapore. The Labor Department has called for a conciliation meeting on April 28 in an affort to resolve the brewing labor dispute. In the meeting, the union will table its twin demand of absorption of the present employees and their participation in the transition talks between SYTIC and C-Pak. 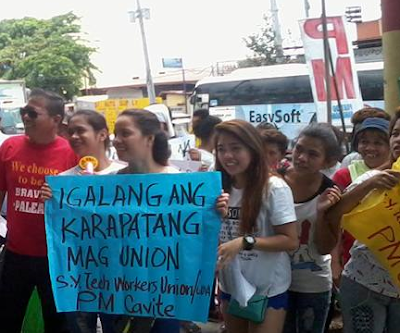 The union’s call to participate in the transition talks is in line with the provision of the Philippine Constitution that workers shall be afforded the right to participate in policy and decision-making processes affecting their rights and benefits.